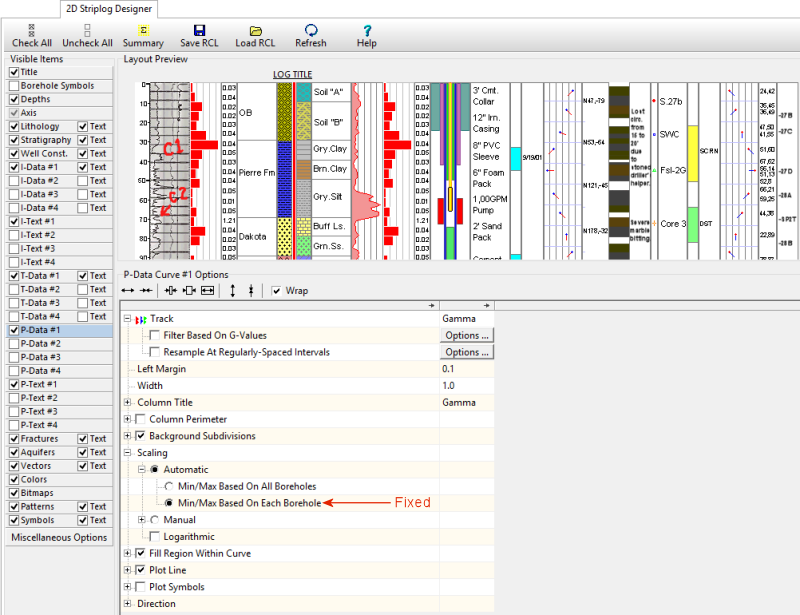 (074) New Feature (04/03/15/JPR): A new program titled "Resample" has been added to the Borehole Manager / I-Data / Analyze sub-menu. This program is used to convert irregularly-spaced, discrete (non-gradational/continuous) i-data to regularly-spaced intervals. This program resamples the data by identifying the thickest sub-interval. In the event that two or more intervals have the same g-value, they are combined into a single interval (for the sake of the comparison). 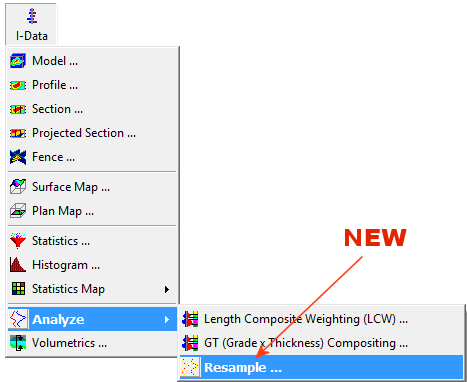 The program then determines which interval is thickest and reassigns the new interval to the corresponding g-value. In the event of a tie (i.e. 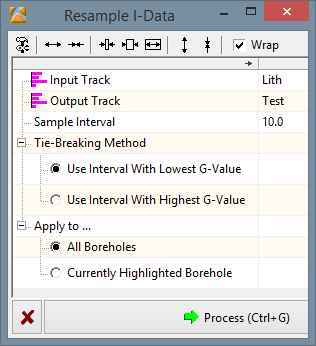 two or more equally-thick sub-intervals with the same thickness), the program will make choose either the interval with the highest g-value or the lowest g-value as defined by the Resample menu. (073) Cosmetic (04/02/15/MIW): The Ignore and Continue button within the error reporting dialog has been changed to "Continue". (072) properly saves all of the settings within the Legend sub-menu. (070) Bug Fix (04/01/15/JPR): The Lateral Extrusion block modeling algorithm no longer omits interpolations along the easternmost, northernmost, and uppermost edges of the model. (069) Cosmetic (03/20/15/MIW): Lines within the Pattern Designer / Preview dialog are now shown as black instead of light-gray. 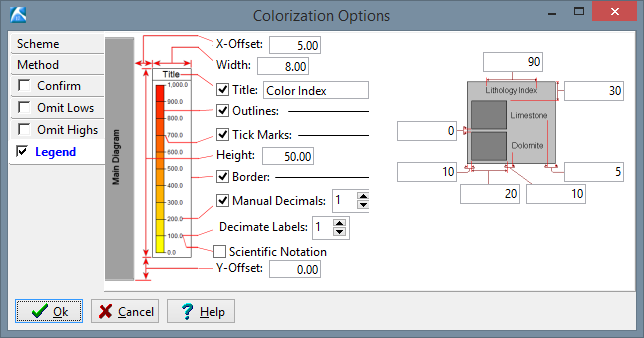 (068) Cosmetic (03/20/15/MIW): Lines within the Symbol Editor are now shown as black instead of light-gray. (067) Bug Fix (03/12/15/MIW): The ReportWorks program now properly registers RockPlot2D diagrams when output at high resolutions and/or page sizes. (066) Bug Fix (03/12/15/MIW): The Utilities / Volumetrics / Block-Model Statistics-by-Level program now computes the proper totals for mass and number of nodes. 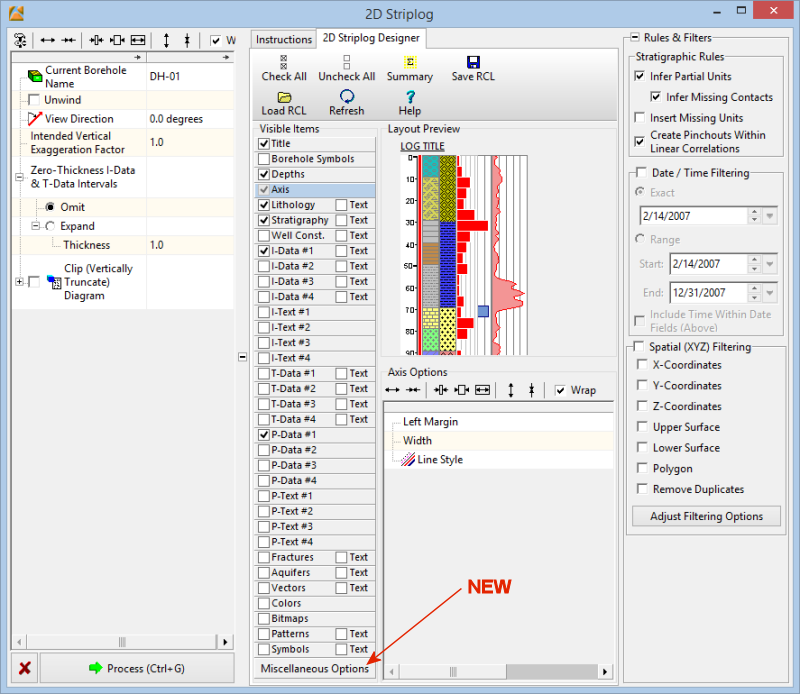 (065) Bug Fix (03/12/15/JPR): The "Min/Max Based On Each Borehole" option within the two-dimensional P-Data striplogs now works correctly. 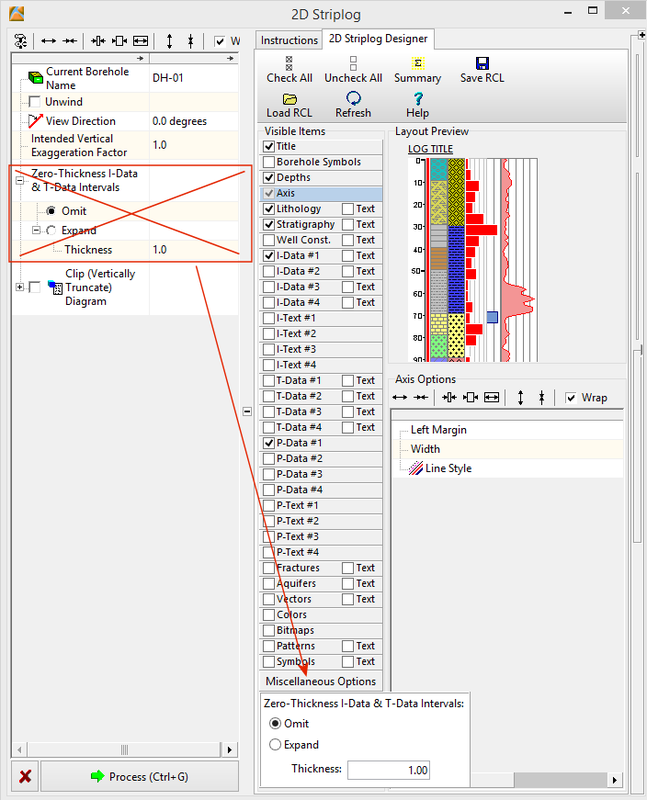 (064) Cosmetic (03/07/15/JPR): The "Zero-Thickness" options have been relocated from the "tree menu" portion of the 2D Striplog menu into a drop-down menu that is activated by pressing the new "Miscellaneous Options" button within the Visible Items list. (063) Cosmetic (03/07/15/JPR): A new menu item titled "Miscellaneous Options" has been added to the 2-D striplog designer menu. (062) Bug Fix (03/06/15/JPR): The horizontal axis title within profiles and sections is now plotted in the correct vertical position regardless of the vertical exaggeration factor.